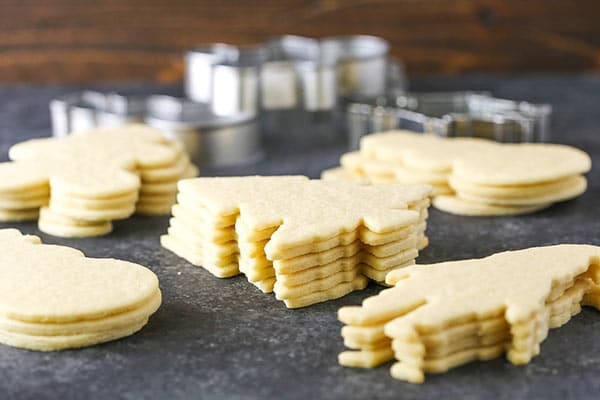 This easy cutout sugar cookie recipe is the best! It makes soft cookies with lightly crisp edges. 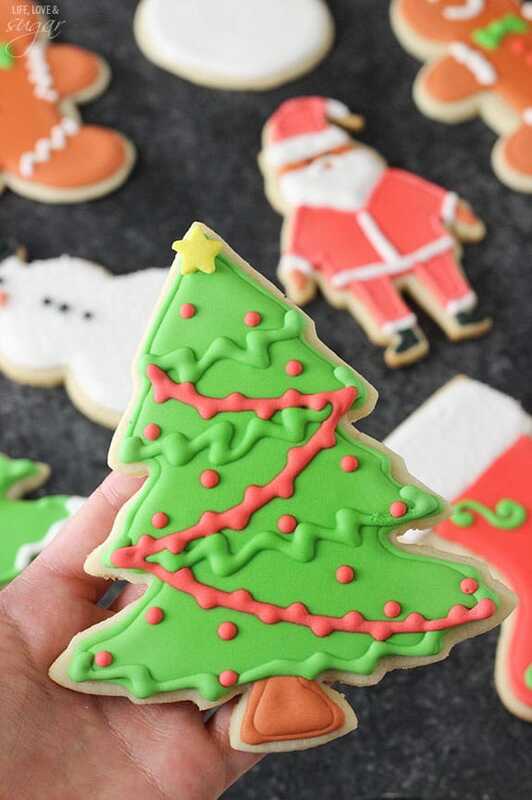 The perfect sugar cookie for decorating! Decorating sugar cookies was a holiday tradition for my family growing up. My mom is not a baker but every Christmas she’d get things ready to make Christmas cookies with my brother and I. These caramel clusters were made very year, along with cutout sugar cookies. We’d actually ice the cookies with a traditional buttercream, but I decided to use royal icing this time around. I also used the same recipe we’d use – with a few modifications. The original recipe actually spread quite a bit. Not really ideal for cutout cookies. So I did some playing around with the recipe and got them just right! I’m not going to lie, they spread juuuusssst a tad. It’s really more that they rise a bit. I considered making them a touch thicker so they didn’t spread/rise at all, but honestly I love them just the way they are. Too thick and you end up with a less than appetizing, dry cookie. The spread really isn’t much and as you continue to work with the dough and re-roll it, more flour mixes in and by the time you’re done, there’s no spread at all. The cookies hold their shape great, even when they spread a tad. You will want to make sure to accurately measure your ingredients for these cookies. 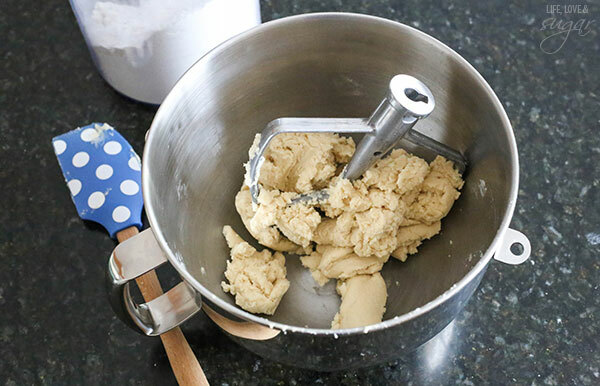 The amounts of ingredients – especially the flour – really do need to be correct to ensure your cookies turn out correctly. Too much flour and you’ll have some hard cookies. Too little and they’ll spread too much. To help with that potential problem, I’ve included weight measurements for those who have a scale. It really is more accurate. If you’re using a scoop, just be sure not to pack in the flour. I pour my flour into a canister and then scoop it out of there, so it isn’t densely packed but is loose. To make the dough, start by creaming the butter and sugar together for 3-4 minutes. You should notice the color of the mixture actually get lighter in color and it should get fluffy in texture. Then you’ll mix in the egg and vanilla, then the dry ingredients. It’s a very simple and straightforward recipe as far as the ingredients and method. The dough will actually be quite thick, even a little crumbly at first. If it doesn’t completely come together with the mixer, use your spatula or hands to press it into a ball. You can definitely refrigerate this cookie dough and make it a few days ahead if you want, but it isn’t required. You can start rolling our cookies as soon as it’s ready. Sprinkle a little flour onto your surface (I used our countertops). 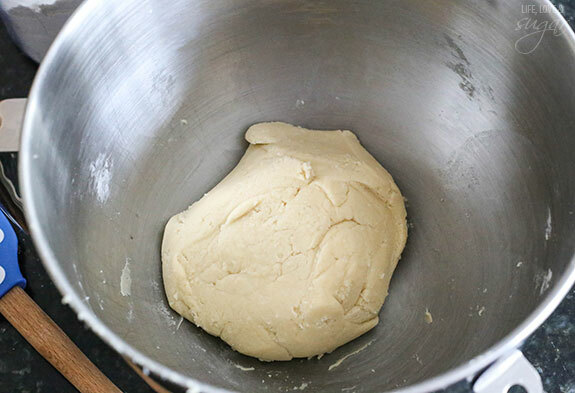 Grab some of the dough – I start with about 1/3 of the dough – and roll it out. 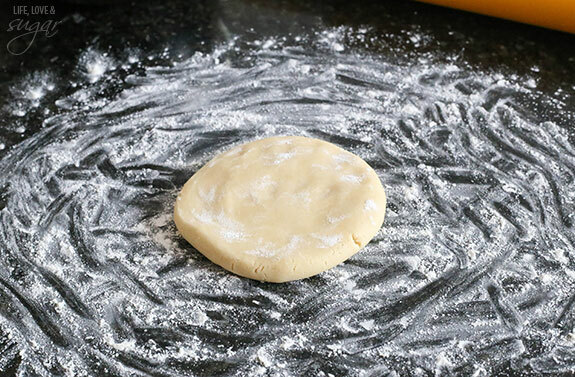 If you find your rolling pin sticks to the dough, sprinkle a touch of flour onto it. You’ll want the dough to be 1/8 to a 1/4 inch thick after being rolled out. Cut out your cookies, making the most of the dough and squeezing in as many cookies as you can. My cookie cutters were fairly big, so I didn’t get quite as many cookies per roll out. 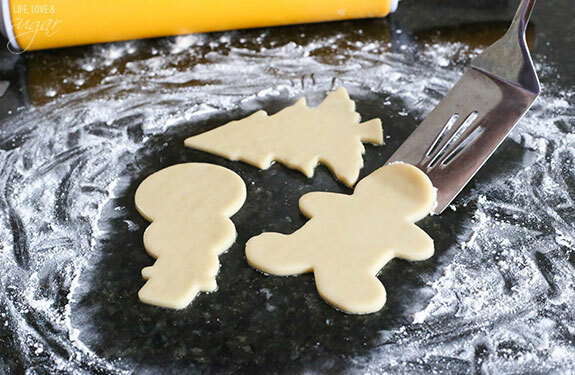 Remove the excess dough and lift the cookies with a lightly floured spatula, then place them on a lined cookie sheet. I like to use my silicone baking mat, but parchment paper would work well too. The cookies bake for 7-9 minutes. You can wait until the edges are just starting to get golden, or remove them a touch sooner. The time might vary a bit between ovens, but 8 minutes was just right for me. Well baked, but not browned. I like mine a little softer. Once you remove the cookies from the oven, you’ll want to let them sit for 4-5 minutes before removing to a cooling rack. They will be fairly soft until they firm up a bit as they cool, so it’ll be easier to move them once they’ve cooled a bit. Once the cookies are completely cool, its time to ice them with royal icing. It’s really not as scary as it seems, it just takes a little time and you need the right tools. I liked these cutout sugar cookies best once I had the royal icing on them. The icing softens the cookie up a bit from the moisture and results in a seriously perfect decorated sugar cookie. If you’re wanting to decorate your cookies with royal icing when they’re ready, check out my post on how to make, color and pipe with royal icing. There’s even a video! 4. On a lightly floured surface and using smaller amounts of dough at a time, roll out dough to about 1/8 to a 1/4 inch. If dough sticks to rolling pin, lightly sprinkle the top of the dough with flour. See my notes about rolling out the cookie dough below. 5. 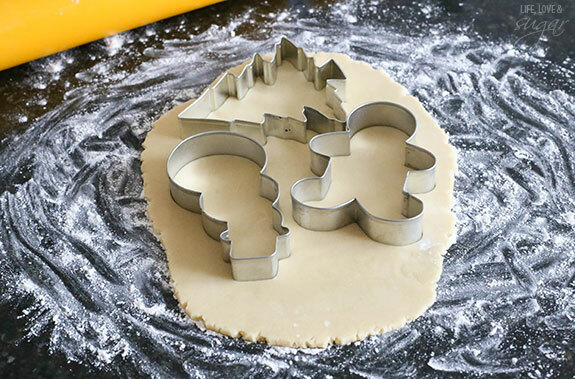 Use cookie cutters to cut out cookies, then transfer to cookie sheet. 6. Bake cookies 6-8 minutes. Remove from oven just before they start to brown on the edges. 7. Allow cookies to cool for 4-5 minutes, then move to cooling rack to finish cooling. The best way to measure the dry ingredients for this recipe to ensure your cookie dough isn’t dry is to measure them by weight. If you don’t have a scale though, be sure not to pack the flour into your measuring cup. I usually store my flour in a separate container from the bag I bought it in, then prior to measuring I use a spoon or other utensil to loosen the flour. I use a scoop to scoop out the flour, then level it with the flat side of a knife. Don’t tap the scoop to settle the flour or pack in the flour. 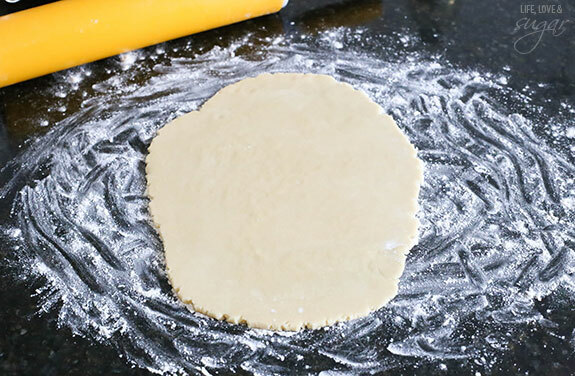 Rather than rolling the dough out onto a floured surface, you can also roll it out right onto parchment paper or a silicone baking mat, then you don’t have to transfer them and move them around after cutting. I’ve started doing this, and also putting parchment paper over the cookie dough when I roll it out so I’m not flouring the dough several times or the rolling pin. 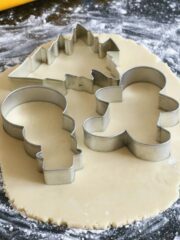 If you’d like to use it, here is my royal icing recipe for decorating the cookies. Hi Lindsay! Does the butter need to be softened first? Thank you! Great, thanks! I look forward to making these with my kids! Can you tell me where you got the cute Santa cookie cutter? Gosh, I don’t even know. It’s one my family has had since I was a kid. I’m sorry! Can you re-roll the excess dough? Yes, definitely. I’m sorry if that wasn’t clear. Just mix it in with the rest of the dough and re-roll. I’d suggest trying to get as many cookies out of each roll though so you don’t add too much flour with each re-roll. These cookies are sooo cute! Your decorations are awesome! OMG….not at all what our cookies looked like years ago! Thanks for the memory! Hope you saved me some! They are adorable and I KNOW they will taste great! Lindsay, like *all* of your baked goods, these are simply gorgeous! I’d like to have one right now to go with my cup of tea. These are gorgeous. I want to figure out how to do a Chanukah version, but my decorating skills are not as amazing as yours. These are, quite literally, perfect! 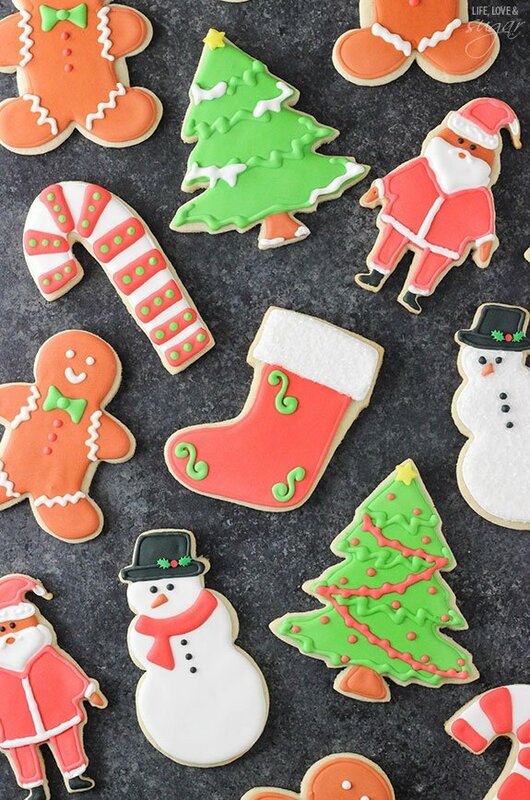 Your sugar cookies and decorating skills are perfect! Hi, I’m just wondering if the baking powder doesn’t make the cookies puff up too much. Can I opt it or will it interfere in the baking process? I would suggest leaving it in, but you could try it. Hi left out the baking powder to make puzzle cookies and they were fine… only difference is crisper cookies which I loved the same way…. Hello, how many cookies would you say come out of one batch? Thanks! I got about 20 large cookies. If you are using smaller cutters, you might be able to get 35-40. Does the butter have to be unsalted? No, you can use salted butter, just don’t add the salt listed in the recipe if you use salted butter. Yes, the egg is necessary. Without it you actually have more of a shortbread, which is much firmer. I’d suggest royal icing or buttercream for topping the cookies. I’m not really sure what I did wrong 🙁 The dough was pulling apart quite a bit and had a tough time combining. After they were baked, they were beautiful and looked soft with lightly crisp edges. But when I bit into them they were dense and very crumbly, not soft. I followed the directions to a T, or so I thought. Any idea where I might have gone wrong? It sounds like there may have been too much flour. With cookies like these, a little bit more or less can make a big difference which is why I added weight measurements in addition to cups, which can be less accurate since everyone measures cups a little differently. You might be able to save them though. Try icing one of them and letting it sit for a few hours. The moisture from the icing will often times soften cookies up and they might still be ok.
I’m having the same issue right now. I haven’t rolled them out yet cuz I can’t get the dough to hold together enough to do it. It’s all crumbly. What can I do to save it? Hmm, you could try adding a touch more butter. You’ll want it to be soft so that it’ll incorporate well. Try 1/2 tbsp at a time. I’d hope 1/2 tbsp would be enough. The other option is to try adding 1 tsp of milk at a time, but I’d think butter would be the better option. I read on the internet you can use Confectionary Sugar to roll out the dough instead of flour. What do you think Lindsay?Thank You! I haven’t tried it, so I’m not sure. Definitely seems like it’d be worth trying. I haven’t tried it, but I don’t think so. Does the butter have to be unsalted? Have you used salted butter before? Yes, I have used salted. If you use salted, just be sure to leave out the addition salt listed. Made these today and they are AWESOME. I used salted butter and it was delicious. Thanks for the great recipe! Do you use self-rising or all-purpose flour? What kind of flour? Would whole wheat work? Thanks! It’s all purpose flour. I haven’t tried whole wheat flour, but am quite certain it would not work in this recipe. I’ve tried a few different sugar cookie recipes this month…this is by far the easiest/quickest…my favorite part? No dough chilling! 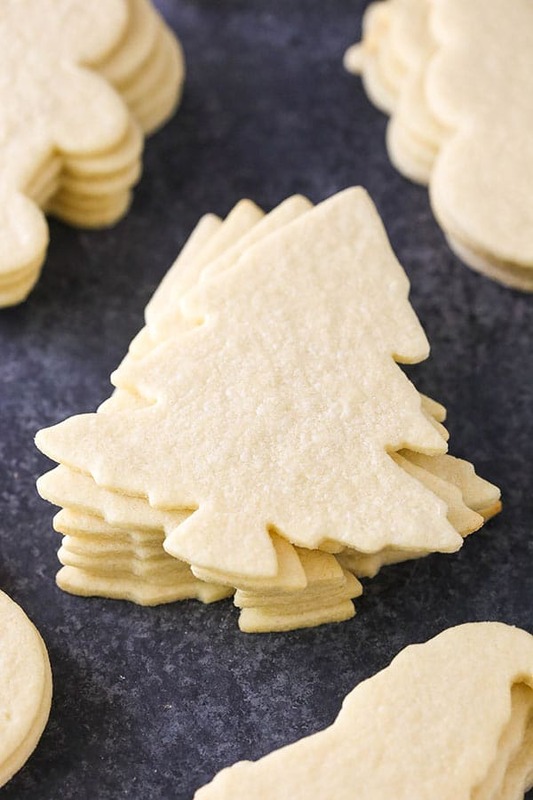 That always keeps me from making cutout sugar cookies, and now I have a go-to recipe! Soft, yummy and sturdy, so great for decorating! Thanks for sharing, and Merry Christmas! Wonderful! I’m so glad you are happy with them! Merry Christmas! Hi Lindsey, I wanted to know what recipe you used for icing the cookies? 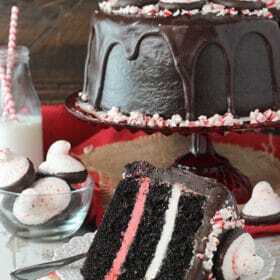 Hi Claudia, here is the recipe and a tutorial for the icing. Thank you so much!!! This was the most easiest cookie ever!!!! ???????????????? Do you really add 1-1/2 tsp baking powder? Does that much make the cookies spread or puff up? I’m new to your site but enjoying reading. Thanks for the recipes and baking tips. Yes, I do. It doesn’t contribute to spreading, but will help them puff up just a bit. How thick did you roll your cookies? Between 1/8 and 1/4 of an inch. Hi..I want to thank you for sharing your recipie..I am so not a cookie baker..but your way was soooo simple..my only challenge now is the decorating piece. Thanks again! Awesome! I’m so glad you are happy with them! Great cookies! I made these tonight for a decorating party tomorrow and easily got 6 dozen 2-2.5″ cookies. I loved that I didn’t need to chill them and they taste wonderful! Wonderful! I’m so glad you liked them! Tried your recipes this weekend for the Super Bowl. Cookies turned out great. One batch with salted butter and no added salt and one batch with unsalted butter. Both excellent! What I really enjoyed was that the cookies didn’t spread!! Hello! I’ve made this recipe twice now, the cookies are just delicious. They definitely spread, so I wouldn’t recommend using this recipe with intricate cookie cutters (which I did the first time). But the second time I did a basic heart and flower shape for Valentine’s Day and they turned out great. One small note I would like to make; when I doubled the recipe I found it just a tad salty with 1/2 tsp of salt. So next next if I double the recipe I’ll keep the salt at 1/4 tsp. But with the icing I put on top they were still perfect. Thanks for sharing! Have you ever tried freezing this dough? Was thinking about making a small batch and freezing the remainder. Thoughts? I haven’t tried it, I’m sorry. I have made very similar doughs and they freeze well. Nigella Lawson makes a sugar cookies that’s almost the same and she encourages freezing. What size egg do you use? I usually only buy XL eggs. Thanks. I’m not sure I totally understand your question. I could suggest the regular bake setting, not convection. Oh I see. 🙂 Sorry! Yes, I’d recommend regular bake setting with one tray at a time. The heat should distribute more evenly that way. This seems like a really great recipe! I was wondering if I could double the recipe with the weight measurements for a bigger batch. Would that cause any problems? I wouldn’t think it’d cause problems, but I haven’t done it. Just made these today and they’re probably the best sugar cookies I’ve ever made. I really appreciate you putting in the weight for the sugar and flour too. One question, how do you get them to be so smooth on top. I had a few that seemed to bubble and and get bumps after baking, but they looked fine after rolling and cutting. The only thing different from your method was that I used parchment instead of a silpat. I’m so glad you enjoyed them! I’m not sure about the bubbling. It sounds like some extra air got trapped in some of the cookies. Was it a later batch after re-rolling the dough? Perhaps some air got in the dough that way? Can you freeze this dough and use a later time? I would think it’d be fine, I just haven’t tried it to know for sure. Can you freeze these cookies after baking and prior to icing them? I haven’t tried it. I’m not sure how well they do after freezing. The link is within the blog post, but I just added it to the recipe card so it’s easier to find. I hope you enjoy the cookies! I loved this recipe, I was very nervous when the dough wasn’t coming together, but if you mix it with your hands it works perfectly. I rolled them into balls since I didn’t have cookie cutters. Then, I rolled the balls in cinnamon and sugar. That made them taste even better! I flattened the balls with a fork and pooped them in the oven! I will totally use this recipe again! How long can you store the cookie? Honestly, the cookie would dry out if made too much ahead. Once frosted, they’ll last a little longer. It depends a little on your tolerance for a crispy cookie. 🙂 I’d say 3-4 days is best, but up to a week or so should be ok.
What a beautiful recipe and story!! I absolutely can’t wait to try this recipe!!! As I’m sure you can guess, it’s really more of an appearance thing. Certainly as a kid, buttercream was easier to work with. The buttercream won’t be quite a firm as a royal icing, but that might not be an issue. I’d think the cookies would last a similar amount of time. Royal icing does typically hold better for longer, but the cookie might be even softer over a weeks time with buttercream because of the moisture. I hope that helps! As an experienced baker I thought I would try your recipe.ni was a little skeptical that there was only 1/2 cup butter to 2 cups flour. However, I follwed yoyr recipe and found myself with not a dough but fliyr meal. So I added another 1/2 cup shortening and the recipe turned out fine. My biggest pet peeve is trying recipes on pinterest that are not accurate ir that ingredients have been omitted. Hi Lynn. I’m sorry it didn’t turn out as expected. The reason for that ratio is that these cookies don’t spread when baked so they maintain their shape. Adding additional butter (or shortening) would likely result in cookies that spread. The ingredients are accurate and nothing has been omitted, so there was likely some other issue. Thanks. I was just comparing recipes and this one has the same flour to butter ratio as the Martha Stewart sugar cookie recipe. I’m so glad you enjoyed them! Merry Christmas and Happy New Year to you as well! 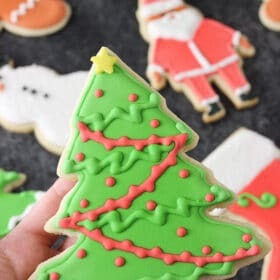 I came across your royal icing tutorial on Pinterest, and decided to use your sugar cookie recipe as well! They came out just perfect! They have a slightly crisp bottom but the cookie itself has a soft but toothsome bite. I really appreciate that you added the weight of the ingredients! It helped keep all four batches consistent. Great recipe, thank you! How cute! I wish my sugar cookies came out like this. How did you make your icing? Recipe Please? 🙂 thank you for sharing!! There is a link to the recipe within the pink card, just below the recipe. Here it is though. 🙂 There’s also a video with it. Lindsay, we’ve made these cookies the last two years and love them! This dough is so easy to make and I love that you don’t have to chill it!! Perfect recipe! Merry Christmas!! What do you suggest if the dough is too sticky to try to pick up ? I’m scared to try more flour since you said to be sure to use what ingredients call for, lol. Maybe refrigerate a lil bit? Where the ingredients weighed? Or did you use cups? If you used cups, it’s possible that you need a touch more flour. We have made these 4 times in the past 2 weeks! They are the BEST!!! Our new favorite cookie! Perfect royal icing! Thanks for sharing! HI! I dont know if somebody ask this before, but I want to know if I can make this in advance, how much time before is recommended and how can I preserve the cookies till the day I will use them? Thanks! Are you referring to the cookie dough itself or the baked and iced cookies? The baked cookies with royal icing already on them should be fine for a week or so. The icing helps keep the cookies soft for longer. I always roll my sugar cookies between wax paper w a sprinkle of flour, will this recipe be good w that?? What size of cookie cuters did you use?? They were roughly 2.5 to 3 inches at their biggest. We made these cookies last year for an event at our church and everyone loved them. This year we will be making 200 cookies. I wonder if I can bake the cookies in a convection oven? So glad you loved them! I’ve never tried a convection oven, but I imagine it might change the way they bake a bit. I LOOOOVE this recipe. Seriously. Foolproof. This is the easiest dough to roll out. Other recipes I’ve had issues with re-rolling and the cookies becoming too tough or deformed while baking. I got four re-rolls out of this and each cookies came out perfectly. I also used your royal icing recipe and tips on different consistencies. Made my first time decorating so much fun! I’m so glad to hear that! Glad you enjoy them! My toddler and I made these today. I didn’t read the note about measuring by weight until it was too late so the dough was super crumbly. I added an extra egg and another 1/4c of butter which worked perfectly( I’ll definitely pull out my scale next time though!). We added food coloring to make various colors as well. Really nice to have a recipe where you can skip chilling and still retain the shape of the cutouts. My dough is very crumbly. Is there no water or oil in this recipe? No, there’s no water or oil. Did you weight the flour or measure by cups? It’s possible a touch too much flour was added. That said, sometimes you need to use your hands to help it all come together. If that doesn’t work you could add a touch of water to help it come together. I made these cookies and they didn’t turn out as i had hoped. They were very crumbly and were not easy to roll. i will not be making these cookies again!! Would not recommend to anybody wanting a fun and easy recipe. Hopefully i will be able to find a better recipe since this one wasn’t good at all. These are delicious and so easy! The only difference I found is I only got about 12 cookies out of the batch using 4 inch cutters and I had to increase the baking time to 15 minutes ( and they still weren’t really brown on the edges). Now on to make 100 for my son’s class Mardi Gras party! I will not make these again. Dough was so dry and crumbly could not roll them out. Can you use cake and pastry flour instead of all purpose? It would likely need other alterations to work. Are you able to freeze these cookies after they are baked? I want to make them ahead and decorate the day before the party! They should be fine frozen. Hi! These are our favorite cookies to make when I feel like making “fancy” cookies…any thoughts on editing this recipe a bottle use as a pie crust? Thanks! Hmm, what a fun idea! I’m not really sure without trying it. I haven’t tried it before to be able to say for sure. I think the condensation from the cookie thawing would mess up the icing though. Followed recipe exactly and it was too dry and did not come together ???? Awesome recipe! They are super soft and taste amazing! My only issue was that the dough was a little dry and crumbly so I added a bit of milk and that pulled it all together. I had the same problem. I added heavy cream, a little at a time until it came together. I will try only using 2 cups of flour next time and see if that helps. Also, after cutting them out I chilled in freezer for 15-30 minutes so they held their shape when cooking and cooked for 10-11 minutes. Turned out great. Can’t wait to make more sugar cookies! This recipe was so easy and amazing! I did have to add 1 teaspoon of milk (1/2 teaspoon at a time) to help it come together into a dough! When I rolled it, I found that it broke a bit (or started to crack) so what worked best for me was to have the bit of dough in a ball and to squash it down with your hands a bit before rolling! 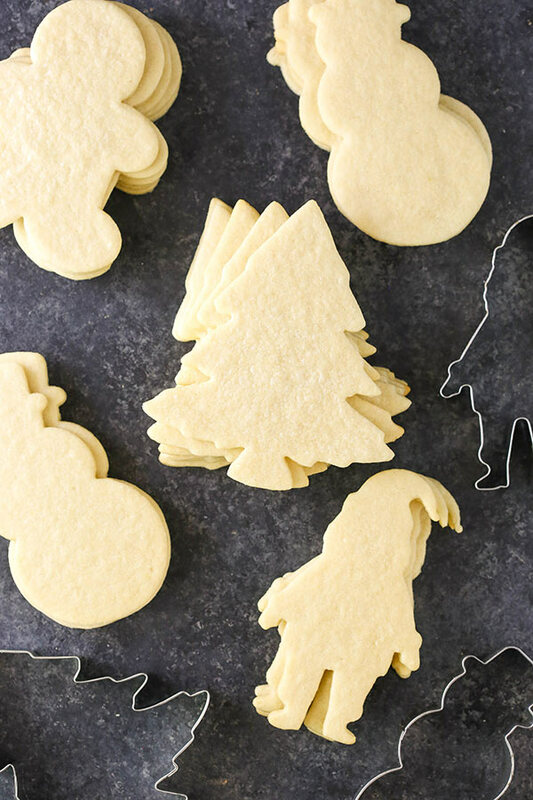 The cookies hold their shape amazingly and are so easy to decorate! I did mine as part of valentines gifts this year and I hope everyone likes them! I naturally dyed the icing pink using raspberries and then when it dried a bit once on the cookies, stamped it with these letters I have (you can use them on fondant too, they are specifically for baking purposes) depending on who I was giving it too! I was wondering if there was a way that we could share our creations with you , how do we send the photos? If I ever need a roll out recipe again, I will use this one! So glad to hear you enjoyed them! You can always email me photos. 🙂 [email protected] Thanks!